We all start our day differently. While some people may consider a morning gym, others prefer booting their brains with a cup of hot flavored coffee to stay caffeinated. The main challenge is looking for a reliable brewer that will help you steam a pot of hot java to quench your thirst. If you’re still in a dilemma, think no further as a single-serve coffee maker is exactly what you need to quench your daily brewing demands. Unlike normal coffee makers, a single-serve coffee maker has one big advantage of letting you brew a single cup of coffee, just enough for you. Single-serve coffee makers have managed to offer a wonderful coffee shop experience at a reduced price range. They’re convenient, reliable, and economical making them the best option for most coffee aficionados who need to stay caffeinated to boost brain performance. Now, having said that, we understand the amount of challenges most people go through when looking for a perfect coffee maker. Having dug deep into the world of coffee makers, we’ve managed to come up with 5 of the best single serve coffee makers that are perfect in terms of value, convenience, durability, and brew quality. Avid coffee drinkers will definitely agree that this machine is the beast of the kitchen when it comes to yielding the best results. Also regarded as a two way single-serve coffee maker, the Hamilton Beach allows you to brew a single cup just for you or an entire 12 cup carafe in case you have some guests. If you don’t want sacrifice your precious minutes of sleep just to brew a cup of coffee, the Hamilton Beach will let you program your brew 24-hours beforehand to ensure that nothing goes wrong in the process. What makes the Hamilton Beach the best option in the arena is the two way brewing option. First, this coffee machine comes with a pod holder that brews any type of coffee without having to measure the content precisely. On the other hand, customers who enjoy roasting their own coffee have also been represented with a brew strength selector that helps you regulate the quality of the brew you wish to achieve. Finally, the Hamilton Beach comes with intuitive control settings and a small LCD screen that displays the brewing time and other relevant settings. At just 1.92 ounces, the Hamilton Beach is considered to be extremely light. The 2-in-1 option allows you to brew a single cup or an entire 12-cup carafe depending on the urgency. It has a handy 24-hour programmable setting. The brew strength selector allows you to select the brew type depending on the type of coffee beans. The settings are very easy to adjust. This unit doesn’t come with a permanent mesh filter. The power cord is pretty small meaning you have to place this coffee maker next to a power outlet. Finally, the Hamilton Beach (49980A) Coffee Maker is a top of the range coffee brewer that does an impressive job of brewing restaurant-quality coffee at the comfort of your kitchen countertop. Designed with 2-in-1 mechanism that lets you brew a single cup or 12-cups of flavored coffee, the Hamilton Beach is a must have if you’re really looking for a mix of style of performance. If you’re looking for a single-serve coffee maker that you can carry almost anywhere without facing any issues, the Aicok Single Serve Coffee Maker is exactly what you need. Designed with the best quick brew technology, this coffee maker will not only brew your coffee within 3 minutes but will also indicate the brewing progress via the light indicator. When brewing is done, the auto-shutoff smart feature automatically shuts off the machine eliminating the hassle of having to leave your precious work to stop the machine manually. For those first-timers in the coffee brewing world, the available touch button is easy to access when preparing to start a brewing cycle. 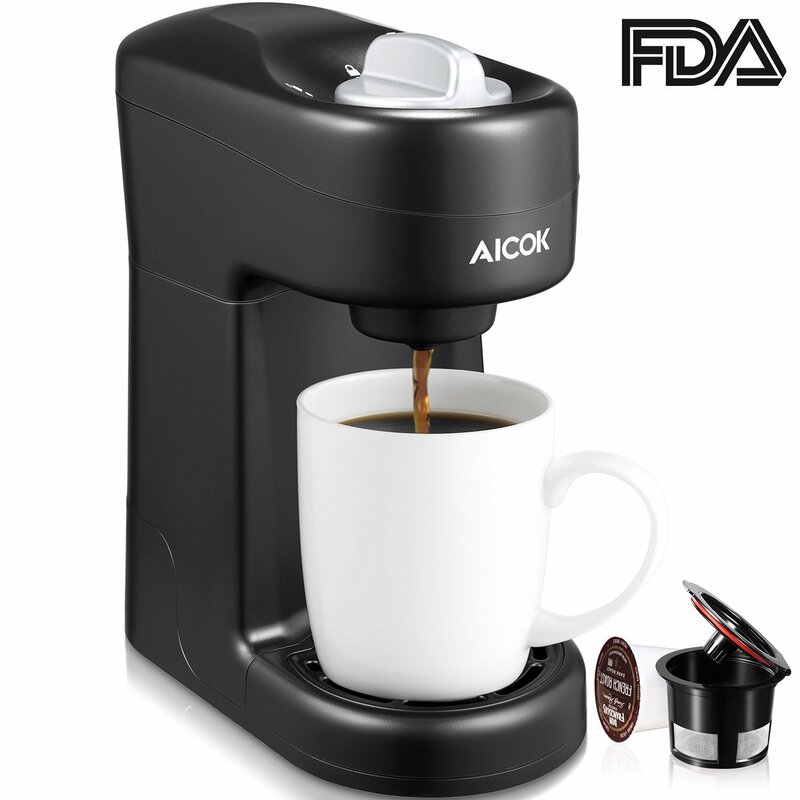 The Aicok Single Serve Coffee Maker is surely a fully automated coffee brewing machine. The single cup design comes with a huge advantage as it makes the unit fully compatible with most single-cup capsules such as K-Cups, pods and Realcups. The available water reservoir is large enough to hold 12 oz of water making it possible for the machine to brew coffee on standard size cups or large mugs. Speaking of the power, the Aicok Single Serve Coffee Maker has a power ratio of 800W and a voltage of 120V making it energy efficient for those customers who’re sensitive with power usage. With a weight of just 2.2 pounds and dimensions of 10.1×5.5×10.8 inches, the Aicok Single Serve Coffee Maker is surely a must have if you’re intending to use it in the kitchen or in your office. This coffee brewer is small enough to fit in your kitchen regardless of the size. It has a wider mouth for adding the water thus reducing the issue of water spillage. The water reservoir is large enough to hold enough water for brewing more coffee. The Aicok is heavily built, easy to operate and very easy to clean. The sleek design of this coffee brewer makes it versatile and easy to use in almost any setting (office, at home, or for leisure). The Aicok is made from BPA free materials and comes with a 2-year limited warranty. This machine takes quite a long time to brew. Some customers have complained about the brewing process stating that it’s too messy. Overall, the Aicok Single Serve Coffee Maker is among the best single cup brewers that does an incredible job of brewing restaurant quality coffee with the least time possible. Although there are some minor issues, I don’t think they’re enough to outweigh the many benefits offered by this single-serve coffee maker. Welcomed with very high ratings, the Aicok is exactly what you need if you’re searching for a compact, lightweight and efficient machine for your brewing needs. Are you a coffee enthusiast searching for a medium sized machine that will advance your brewing needs? Well, the Coffee Maker Machine Electric Single Serve Brewer is exactly what you need. 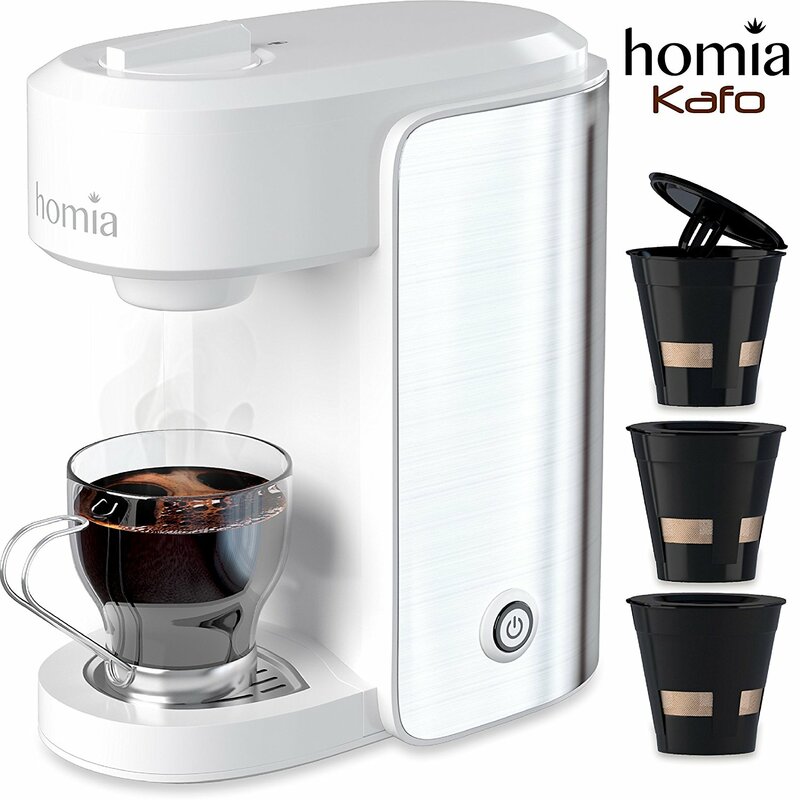 Manufactured by Homia, this coffee maker is fitted with multiple programmable features that give it a one-time simple operation at just a press of a button. To start off, this machine is fitted with a powerful 1000W heater that raises the temperatures to a remarkable 195°F in less than 3 minutes. What’s the result? This definitely results in brewing restaurant quality coffee that’s enough to keep you caffeinated throughout a busy working day. When it comes to the functionality, the Coffee Maker Machine Electric Single Serve Brewer has everything you’d expect to see in most top-of-the range single-serve coffee brewers. First, it comes with a large 12 oz water tank that holds enough water to help you brew coffee to meet your brewing needs. Speaking of the K-Cups, this machine comes with three reusable k cups that save you the cost of having to buy new k cups anytime every time you want to brew. 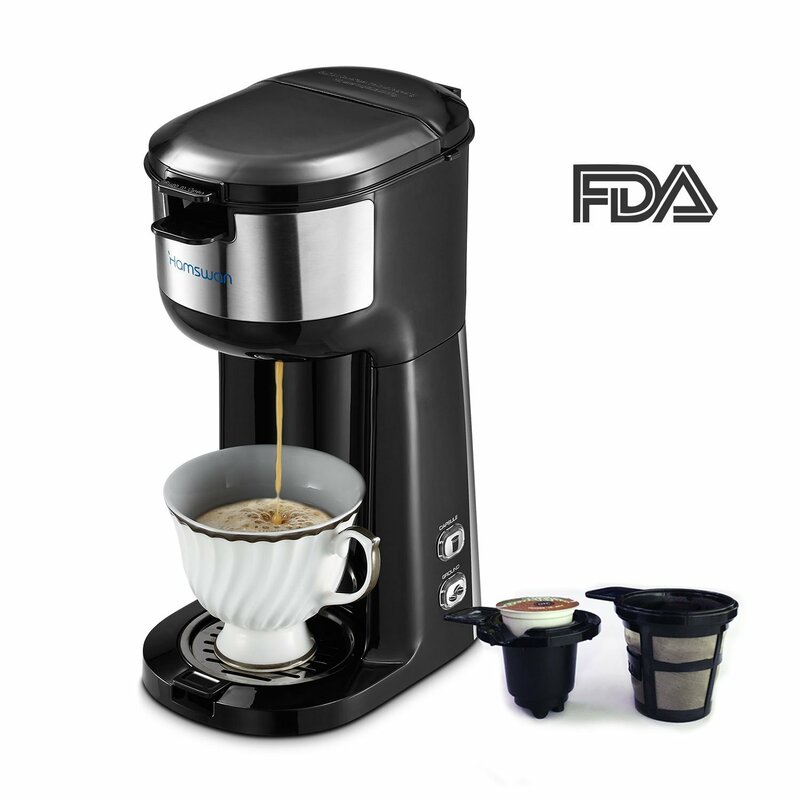 This single-serve coffee maker comes with an auto-shutoff feature, BPA and FDA approved plastic material, a noise level of 60db and ability to brew a wide range of drinks ranging from coffee, tea, milk and hot chocolate. The Coffee Maker Machine Electric Single Serve Brewer comes with a one-touch control button that lets you brew your favorite coffee within a fraction of time. With a weight of just 3.22 pounds and sleek dimensions of 5.1×10.2×8.7 inches, this coffee brewer is the perfect option for both small and large kitchen setups as it doesn’t occupy much of your countertop space. This machine comes with 3 reusable k cups that saves you the hassle of having to buy new cups after every brewing process. Apart from just brewing coffee, this single-serve coffee maker is able to prepare flavored hot chocolate, make tea and milk depending on what you wish to enjoy. With a heating temperature of 195°F in just 3 minutes, this coffee maker is able to brew coffee pretty faster than most of its competing products. Some customers claim that that it leaks coffee which could leave your countertop in a real mess. The parts are quite difficult to remove when cleaning. The medium size of the Coffee Maker Machine Electric Single Serve Brewer comes with a huge advantage that lets it fit in both small and large kitchen settings. The price range is perfect for all customers to afford while the available features are brilliant enough to take your brewing needs to a whole new level. How well do you boost your brain performance? While some people prefer taking energy drinks to stay active, real men consider going for a cup of hot java to stay caffeinated. 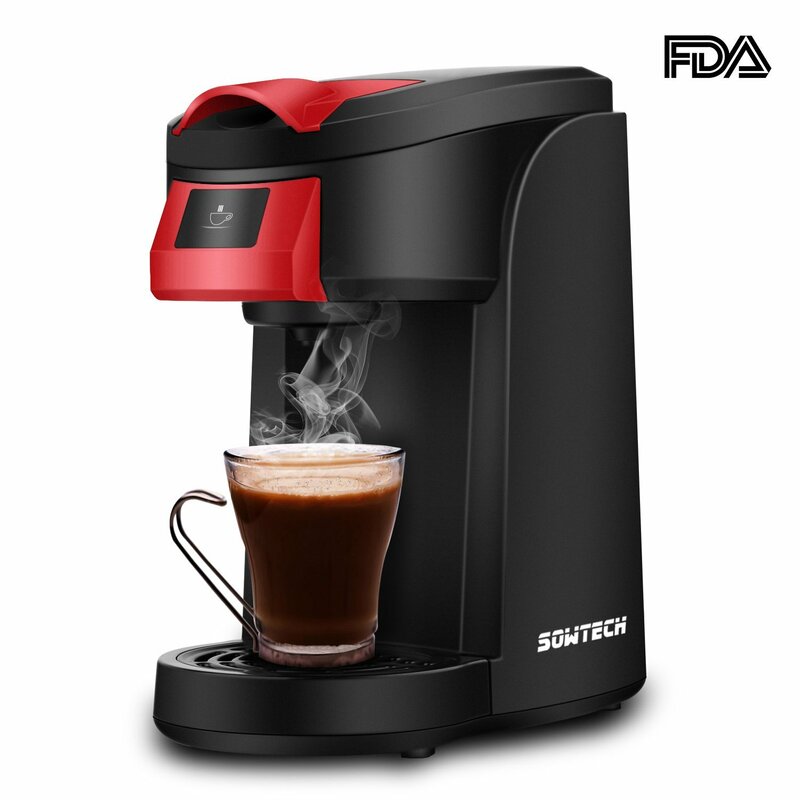 One of the best coffee makers you can think of in such a situation is the SOWTECH Single Serve Coffee Maker. Built with an inspiring black and red outer casing, this coffee maker is stylish and cool enough to give your kitchen an inspiring appeal. If you want to enjoy the best cup of joe, the Single Serve Coffee Maker SOWTECH has got you covered. 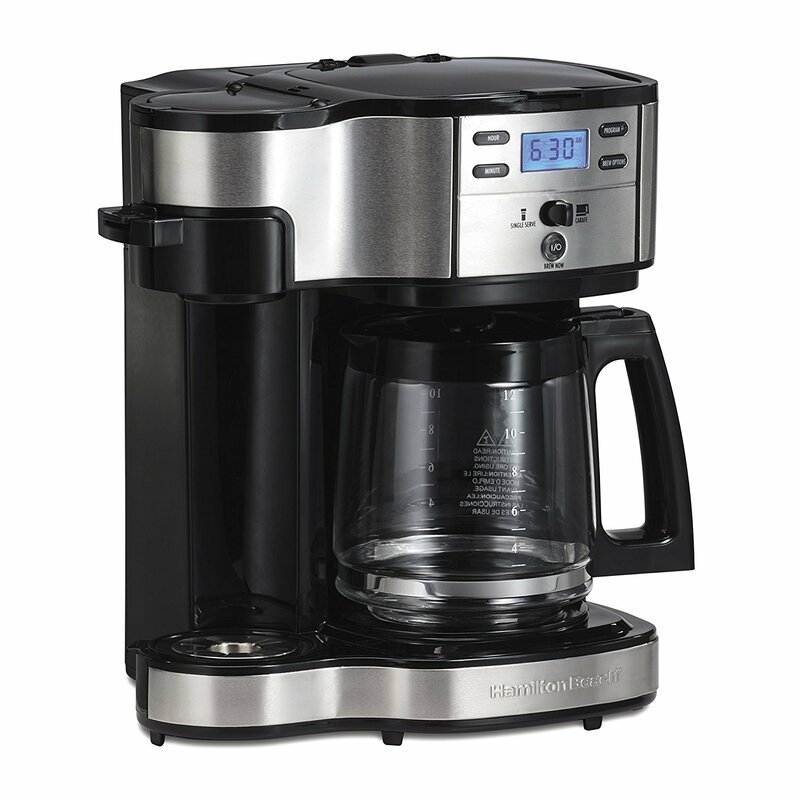 First, this machine comes with easy to use programmable features that include; a touch control button, a proprietary technology that lets you enjoy a hot cup of coffee, an auto-shutoff feature, and the ability to brew over 25 different types of brews all at the comfort of your home. Speaking of the simplicity, let me mention that indeed SOWTECH has already done their homework. Their innovative machine comes with easy to clean parts that keep the interior ever clean to maintain the high-quality flavored brew. The 12 oz water reservoir is large enough to brew at least 1 to 3 cups of coffee enough to suit your needs. This brewer is able to brew a wide range of coffee drinks ranging from Espresso, Chococino and Latte. This machine has an attractive black and red color combination that will definitely suit your kitchen décor. Coffee enthusiasts will enjoy using all varieties of k cups when drinking their coffee. This coffee maker is very easy to clean. The large reservoir holds a maximum of 12 oz of water enough to give you a flavored cup of hot java. This coffee maker is available at an affordable price. This coffee maker may break down after several months of consistent use. When searching for a programmable coffee maker, the first product to add in your Wishlist is the Single Serve Coffee Maker SOWTECH. Available in a compact design, this coffee maker is easy to carry to any of your preferred destination be it in your office, kitchen, or in your backyard in case you have some guests. The brewing features are smart and concise while the color, the design and the performance are all perfect for such an impressive single-serve coffee maker. In case the Single Serve Coffee Maker SOWTECH did not appeal you, then you can consider one of its close competitors; the HAMSWAN Single Serve Coffee Maker, . Just like its name sounds, this single-serve coffee maker from Hamswan has managed to revolutionize the world of programmable coffee makers due to its convenient and high-quality features. To give you the best out of both worlds, this brewing machine lets you choose between the k cup insert and the coffee basket insert when it comes to brewing your best coffee. It has removable trays for easy cleanup and an inbuilt stainless steel filter for precise water purification. The self cleaning option is just impressive as it lets you clean the machine automatically with just a press of a button. To enhance safety of this single-serve coffee maker, Hamswan has added a dry fire protection feature which cuts the power automatically when the water tank is empty. The auto-shutoff feature is another impressive feature that switches the machine off after brewing is complete. Designed with a power rating of 1000W, the HAMSWAN Single Serve Coffee Maker is a must have if you really wish to advance your coffee brewing needs. Very easy to operate thanks to the multiple programmable settings. There are two brewing options that give you a chance to make an informed decision on how you wish to brew your coffee. The quick brew function lets you enjoy a cup of hot coffee within two minutes. The auto-shutoff dry-fire protection features work together to enhance maximum safety when the machine is operating. The auto clean option lets you clean this machine with just a press of a button. The black outer finish is just outstanding as it will definitely match your kitchen décor. This coffee maker is not the best for large servings. Another issue is with the parts which are very delicate and easy to get damaged. Overall, the HAMSWAN Single Serve Coffee Maker is a great product especially when you consider the price range. Designed with the best features all at an affordable price, I don’t see the reason why this single-serve coffee maker shouldn’t be given a priority to shore case what it can do. It’s sturdy, stylish, fast and above all, it’s very easy to operate. If you’re in a lookout for a reliable single-serve coffee maker, then you’re in the right place. Following a high demand of coffee makers in the market, the majority of the manufacturers have gone ahead to release some of their best brands to meet customers’ demands. In the process, off-shore and non authentic products have found their way into the market leading to multiple disappointments from customers. Now, having heard your cry, we’ve managed to prepare some pointers such as things you need to look up to, how to choose, as well as benefits of single-serve coffee makers. Please read on. What is a single-serve coffee maker? While a lot has already been said about single-serve coffee makers, one question still stands; what exactly is a single-serve coffee maker? A single-serve coffee maker is actually a type of a coffee brewing machine that prepares enough coffee to suit a single portion. These machines are time efficient, convenient and operate with less effort making your coffee brewing experience less of a hassle. When brewing coffee with these types of coffee makers, users always have the option of pouring coffee in a K Cup, a mug, a carafe or a jar depending on the amount you wish to brew. Now, to ensure that you get a value for your money, here are some key factors you need to consider when choosing a single-serve coffee maker. Here, you’ll need to think more extensively as there are many types of single-serve coffee makers available in the market. First, you need to get what you can afford by choosing a coffee maker that lies within your budget. Secondly, you need to think of the operating cost. This is where you think of the operating mechanism, power efficiency and whether or not it uses capsules, K cups, pods, carafe or normal mugs. Next, there’s the time factor. How long are you going to wait for that cup of java to brew? If you’re a person always on the go, you need to invest in a coffee maker that brews just a small amount of coffee enough for you (around 4 to 5 oz). On the other hand, if there are other family members involved, or maybe you’re the type of person who invites friends and family over to watch a soccer match, then a bigger single-serve coffee maker that brews around 12 oz of coffee might be ideal. When planning to buy any machine, one of the factors you must consider is the ease of operation. In the case of a single-serve coffee maker, you need to think of how easy it will be to adjust the settings and brew a cup of hot flavored java without having to break a sweat. Make sure that what you get is easy to clean, easy to operate and easy to read and understand the settings. Finally, we have the issue of features. In most cases, the more the features a product has, the higher the price will be. To avoid spending more, always research the features to see whether they suit your demands. Also, make sure the type of single-serve coffee maker you buy has simple to understand features that have been layered in a concise manner making it easier for you to operate. Now that you’ve already made up your mind on what you really need, the next thing is to survey the product to make sure that it meets all your demands. Here are some pointers you’ll need to keep in mind before parting with your money. When choosing a single-serve coffee maker, you need to pay attention to the size. Depending on the available space in your kitchen countertop, it’s wise that you get a coffee maker that will fit perfectly without eating away much space. Does it have a filtration system? You see, for you brew a flavorful cup of hot coffee, the water used must be filtered. Although this is a rare feature, choosing a single-serve coffee maker with a perfect filtration system means that you’ll always enjoy a flavored cup of coffee on a daily basis. Another factor you need to think of is the brew strength. You see, the best coffee makers should be fitted with customizable settings that allow you to adjust the brew strength depending on your needs. With such a machine, you can easily prepare light or dark brews with just a little effort. Does your machine have a timer? This is another key factor that must be observed when choosing a coffee maker. If your wish is to find a freshly brewed cup of coffee waiting for you downstairs, then you need to think of a timer. Finally, to get the best coffee maker that will not wave goodbye and leave you in mere disappointment, its paramount that you read through the available customer reviews to see what others say about it. If the ratings are good and the feedbacks are inspiring, then you should definitely go ahead to make your purchase. 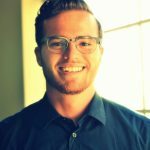 Before we call it done, I think it’s great if we can highlight some key benefits of buying a single-serve coffee maker over other coffee makers. If you live alone and you’re a fan of coffee, the last thing you’d like to see is a coffee maker that wastes a lot of your brew. Instead of incurring heavy costs of power usage and buying coffee that will soon be wasted by a 6 cup or 12 cup coffee brewer, it’s better to buy a single-serve alternative that will brew a single cup of coffee at a time. Another benefit of considering a single-serve coffee maker is the time factor. You see, most of the single-serve machines offer quick results as you’re only required to fill the water reservoir, add coffee and hit the button to brew fresh first-class coffee. As you’ve already seen in the products reviews above, most coffee makers offer you the freedom to enjoy what you want. You can brew a small cup of espresso to a large mug of restaurant quality java with just a press of a button. Although price fluctuates depending on the brand, most of the single-serve coffee makers in the market today are available at an affordable price. Once you get what you really need, I don’t see the reason why you won’t enjoy a top-notch-cup of hot coffee without having to break the bank. Finally, single-serve coffee makers are compact and sleek enough to fit in almost any kitchen setting. Whether you live in a large apartment or just a small single-room setting, this coffee maker will be of great benefit and will not eat away all your countertop space. Does a single-serve coffee maker have a brew strength option? Yes of course. Single-serve coffee makers are designed with a brew strength option that lets you brew a particular type of coffee without any difficulties. With the help of other useful features such as large water reservoir, you’ll be able to measure the amount of water required to brew either light or dark coffee. Why buy a single-serve coffee maker over other alternatives? That’s a great question. You see, just like how we mentioned it earlier in this post, a single-serve coffee maker has many benefits that make it the ideal choice for kitchen use. They’re compact, light, easy to handle and above all, they reduce coffee wastage as you’ll always brew what you need. How fast do they brew coffee? Well, this depends on your patience and the type of machine you’re using. The best thing about single-serve coffee makers is that they take the least time possible to prepare a single cup or restaurant quality coffee. By just hitting the brew button, this machine can take anywhere from a minute or two minutes to prepare your coffee. I believe every potential customer out there will be in a position to make an informed decision when making a purchase. Single-serve coffee makers come in varying sizes and designs. To enjoy the best out of both worlds, you need to consider the features, the overall quality and the performance to ensure that you get exactly what matches your needs. Having reviewed five of the top single serve coffee makers in the market I’d rate the Hamilton Beach as the best among the five. That’s it for today, happy brewing guys!